Do you want to know the real reason why you can't lose weight? Are you fed up with being overweight… feeling heavy, unfit, slow and lethargic? Perhaps you find yourself thinking ‘I’m never going to lose this weight’ and you feel embarrassed and disheartened? How much frustration and unhappiness is this causing you? How much does it affect your ability to live your life fully? How much has it impacted your confidence and self-esteem? Perhaps you’ve tried lots of different diets and exercise regimes before, maybe you’ve even lost some weight only to put it back on again – you know…the typical yo-yo dieting, and you still find yourself struggling with weight! I do understand this continuous struggle….for years I just couldn’t control my weight nor maintain a reasonable level of fitness, until I realised the real issue! Once I realised that my weight directly related to my emotional state, a light bulb really turned on! It was then that things really started to change for me. This inspired me to learn more and then I really wanted to help others who faced similar challenges. And now through my own experience, broad studies, and 15 years working with human behaviour I have the understanding, the tools and the passion to help you! We’ve developed effective weight loss programs that have helped hundreds of people release unwanted kilos and gain control of their weight (and their life), whilst improving their fitness and overall health, and empowering them to make important lifestyle changes to maintain their ideal weight. Sure health, fitness and your weight is definitely a result of your eating and exercising habits, but there is so much more to it! Your weight is also a direct result of your underlying psychological and emotional patterns. Holding onto emotional baggage leads to holding onto weight on the body, ie. excess emotional baggage = excess weight! The typical approach of the diet and fitness industry solely focuses on your eating and exercise habits, but not the causes behind these habits; your underlying emotional patterns and your mindset. They attempt to help you change your habits without addressing the underlying issues…it’s like putting a band aid on an open wound that needs stitches! And that’s why they don’t work, especially long term, and you’ll go back to your old habits. So the key is to address the causes; identify your underlying psychological patterns, whilst empowering you with cutting-edge tools to improve your lifestyle habits. 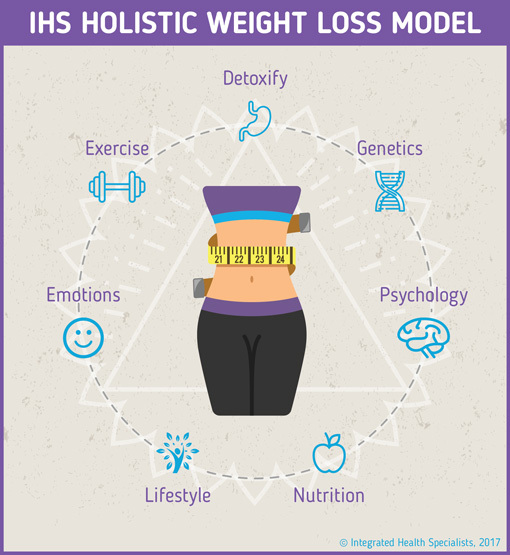 At Integrated Health Specialists we have designed unique holistic weight loss programs that address the causes of your weight problems, whilst empowering you with the tools to improve your lifestyle – long-term (no quick fix, magic wand approach here)! You will work with your psychologist to overcome your negative mindset or beliefs that hold you back from achieving long-lasting change, and explore how these beliefs directly link to your self-worth. You’ll learn cutting-edge psychological techniques for changing your thoughts and beliefs that have prevented you from successfully losing weight and keeping it off. We will initially work with your conscious mind to improve your awareness of your emotions, thoughts, and conditioned behavioural responses. Then we will start working directly with your subconscious mind; here we use transformational mind techniques like Hypnotherapy, Neuro Linguistic Programming (NLP) and Emotional Freedom Techniques (EFT). What goes on in the unconscious mind governs how you eat, how you exercise, your levels of motivation and your energy! Inner conflict occurs when your conscious mind and your unconscious are not working together. You will also be working with us to develop an exercise and healthy eating plan that is individually designed for you using Nutrigenomics (DNA Testing) to find out your optimal diet and macro-nutrient ratios for your specific genes (no one size fits all approach here!) We focus on creating permanent positive lifestyle changes – not fad diets because these do not work, they usually do more damage than good, and they can not be sustained! You’ll also have your own personal training sessions twice a week where you’ll learn how to exercise effectively to meet your specific goals. You’ll experience our Trolley Overhaul – this is where we will accompany you to the supermarket. We’ll get a realistic picture of what your current diet consists of, and will offer you healthier alternatives to consider. You’ll learn how to interpret those tricky labels on food packaging and avoid those clever marketing traps. You will also work with our Naturopath and undergo a Bio-Impedance Analysis which enables you to maximize your weight loss, optimise your training, increase your vitality and fine tune your nutrition to create a better body and slow down the ageing process. You will also have a Real Time Blood Screening to identify any underlying health issues that need to be addressed which could also be impacting your weight. You’ll be very well supported on your program with our qualified Psychologist, Health & Fitness Coach and Naturopath working beside you to ensure you are on track and your new lifestyle habits are progressing well. We are so confident that you will find our Holistic Wellness Program so life-changing, that we offer a full 100% money back guarantee! If you complete all the set tasks and attend all scheduled appointments, then if at the end of your program you are not completely satisfied, we will refund your money in full. That’s how confident we are in our signature program!